Ah, when I get that 3-book contract, how sweet it will be. "Hey, Susan, XYZ ezine is looking for articles." Yawn. Someday, I'll be interviewed on Larry King Live. "Guess what? I read on so-and-so's blog that a new anthology is looking for submissions." Sigh. When is that big break going to happen? Sound familiar? How many of us are dreaming about that super deal, but allow scores of writing gigs to pass us by without a second glance? Maybe it's not the ideal assignment, but it's a step in the right direction. Scripture tells us not to despise small beginnings. Each time one of my submissions is published, I'm adding to my writing resume. This blog is here because those small successes gave me the confidence to take another step forward. Every day, I'm writing (even if I'm not posting), learning the craft, and becoming industry savvy. When that writing opportunity knocks, roll up your sleeves, and fire up that computer. Scan those Writer Guidelines, and submit your best work. The writing life is not about instantaneous publication, but rather progress in small, steady increments. Hmm, I think I'll go work on a devotional. That last acceptance letter said they hoped I'd submit again. Pictures of hungry children tear at our hearts. I recently heard about a website called: freerice.com . The site has a vocabulary game. For every correct answer, grains of rice will be donated to the hungry through the U.N. For all those who write, love word games, and want to help feed those less fortunate, check out this opportunity. P.S. I noticed the site addresses are not showing up as links. You can copy and paste them into your browser. I'll have to research and correct the problem. One year I waited until the last minute to gather all I needed for a writers' conference. This resulted in a less than stellar and somewhat nerve-wracking experience. So rather than focus on the externals of conference preparation, I thought a post on how I'm getting ready spiritually, mentally, and emotionally might encourage you. 1. I'm giving myself the gift of time. No, of course I can't add days to my life. However, I can prioritize so I'm not tearing my hair out at the last minute. When I've had adequate preparation time in the past, my confidence level soared, and I felt better physically. No conference-cramming for me this year. 2. I'm paying attention to the details. Learning from past bumps and bruises, as well as other people's experience, saves a lot of grief. Watching countless ice-skating competitions has driven home one simple fact. A fraction of a point can spell the difference between success or coming in second. After getting the basics down, the skaters perfect their artistry and work on the finer points of their performances. As a writer, I need to get the big-picture stuff to the place where it's automatic and then work on those special touches that make my writing unique. 3. I'm praying and asking others to pray for me. This sounds like a given, but it's easy for me to get wrapped up in the mechanics and forget the obvious. The best stress buster of all involves sitting at the Master's feet. Jesus said to ask and we'd receive that our joy may be full. James urged us to ask God for wisdom if we were lacking in that area, and He would give it liberally. Not long ago, I was obsessing about a knotty situation. It finally dawned on me that I hadn't brought my concerns to the Lord and asked for His wisdom. The moment I asked, a Scripture surfaced in my memory, giving me the direction I needed. I could have saved myself a lot of turmoil if I'd asked sooner. So, a major part of my conference preparation is prayer. I'm asking for wisdom, direction, and God's favor. I've also requested friends and family to agree with me in prayer. Father, I ask You to give each writer attending a conference a new perspective. May they walk with you each step of the way, depending on Your loving care and grace. May they experience Your peace through every moment of the day and receive all You have in store for them. In Jesus' name, amen. Besides a lamp and clock radio, a stack of books completes my nightstand vignette. At any given time, I'm reading from 2-3 books. 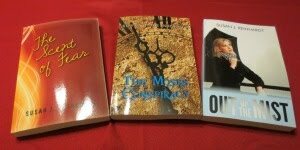 While Bible reading, journaling, and prayer jumpstart my day, reading fiction and non-fiction is an evening activity. One of the volumes currently residing on my nightstand is A Rush of Wings by Kristin Heizmann. Noelle St. Claire, a wealthy young woman, snaps and heads for parts unknown. She settles down at a Colorado ranch, hoping to find safety. The author deftly paints Noelle's emotional turmoil, using effective imagery. What long-buried trauma holds her in its grip? I could sense her panic when faced with new relationships. Noelle's desperate efforts to escape the nightmares and anxiety attacks, as well as the heart-warming romance, kept me turning the pages. What are you reading? The price of gas jumped to $4.07.9 as of yesterday. Last week, when we were in W. Va., I'd hoped to fill up my tank at a less expensive price. On our previous visit, the gas was twenty cents less per gallon than at home. This time, the price differential was a mere three cents per gallon. My tactics for saving on gasoline include topping off the tank when it's at the 3/4 level. Why wait until it's almost empty and pay ten cents more a gallon? The price isn't coming down even after the weekend. I'm combining errands, making fewer short runs, and have all but given up rides in the country. Ouch, that last one hurts because it's something I love to do. Please note I've added several links to my blogroll. Randy Ingermanson's Advanced Fiction Writing Blog is a daily stop for me. Check out the archives. If you sign up for his newsletter, he's got a bunch of freebies for you. By the way, don't be put off by the word, "Advanced." There's something for everyone here. Before we begin a journey, whether short or long, Mom and I always pray. Last Friday was no exception. The day was picture perfect for traveling, the traffic moderate, and the mood upbeat. Within five minutes of merging onto I-81, a loud pop announced the blow out of my rear, passenger-side tire. Hoping the sound we heard might be another car or truck backfiring, I pulled over to the shoulder. Mom opened the car door and peered at the tire. In a voice as flat as the tire, she reported our initial assessment was accurate. Following a call to a motor club, Mom got out of the car and I climbed out via the passenger-side door. With tractor trailers and cars whizzing by, there was no way I would open the driver-side door. We then prayed and waited for help to arrive. A car pulled over in front of us and stopped. A young couple and teenage girl approached and offered to change the tire. The man identified himself as an auto mechanic. The woman reassured me he often aided motorists in distress since no one had stopped to assist her in a similar situation. A State Police Officer soon joined the group. His squad car alerted approaching traffic to the disabled vehicle. We cancelled the motor club request, and marveled as the young man changed the tire in a matter of minutes. The Officer and auto mechanic agreed the tire was beyond repair, and the spare would not get us to our destination. The couple suggested I follow them to a dealer where I could purchase a replacement. At one point, we lost each other in traffic. I caught a glimpse of them as they turned a corner. Already beyond the intersection, I located a place to turn around. We saw them sitting in a parking lot waiting for us. Before we could get there, they left. I prayed, and we reconnected several blocks down the road. Relief flooded me as I parked the car in the shopping center lot. The adventure wasn’t over yet. The tire dealer informed us there was a two-hour wait. The young auto mechanic, former Marine, and rescuer of damsels in distress grabbed a telephone book and found another dealer. A short telephone conversation with the service desk, and we headed over there. Our new friends, Jake, Beth, and Brittney, bid us farewell and entrusted us into the capable hands of Jeff, of Colonial Tire and Auto Center, in Harrisburg, PA.
As I paid for the tire, I noticed a Scripture verse written on a whiteboard: Philippians 4:19, “But my God shall supply all your need according to his riches in glory by Christ Jesus.” My heart almost burst with praise to the Lord for how he took such good care of us. So, a big thank-you to Jake, Beth, Brittney, and Jeff for going above and beyond the call of duty to help two stranded travelers, and to the State Police Officer, who got both our cars safely back onto the highway. I don’t believe in coincidence. As one person I know is fond of saying, “Coincidences are God working anonymously.” I’m glad all of you were at the right place, at the right time. May the Lord bless you for being Good Samaritans. Since the company I work for celebrates Flag Day, Mom and I decided to take advantage of the day off and visit family in W. Virginia. Because of this brief trip, Monday's post may not show up until the evening. These sites deal not only with the craft of writing, but also the business of writing. While all of us would prefer to give 100% of our attention to the creative side, the need to understand publishing is a fact of life. As Christians, we view writing as a high calling. Yet, to reach our audience with the wisdom, wit, and stories God has birthed in our hearts, it takes plain, old hard work. Soon after joining the writers' group, I heard about a small, local writers' conference. I hemmed and hawed, but my husband convinced me it would do wonders for my confidence. The workshops and meetings with editors were pivotal to my future as a writer. One editor liked my writing sample and offered me an assignment in her ezine. We often chuckle about that day. She said I looked like a deer staring into the headlights of a car. Like many newbie writers, I couldn't fathom producing a devotional or article if it didn't spontaneously spring up from some inspirational moment. The devotional was the first of many short articles I did for this publication. I eventually attended the Greater Philadelphia Christian Writers' Conference. The contacts with editors resulted in several other writing credits, including 7 devotionals for Devotions Magazine. One of my stories appeared in an anthology called, His Forever. As a teen, I'd often read the Sunday School take-home paper, LIVE. I dreamed of someday writing an article for them. You can imagine my excitement when they accepted a short, true story. For the last 3 years, my novel about a Christian family in the year 2025 has been my pet project, my passion, my frustration, and the focus of my writing life. I can't count the number of times I came home from a writers' conference or a workshop and re-wrote entire chapters because of some new technique I'd learned. After being told at one conference that I had a good first draft, discouragement threatened to tank the whole effort. Instead, I did a major re-write. With many edits behind me, I've decided to seek agent representation at this year's Philadelphia Conference. My writing journey is a long road with many miles still ahead. I'll keep you posted. While meandering through life, writing would occasionally ambush me. The funny thing is I didn't even take notice. As a kid, I attempted to write a book after being enthralled with the Bobbsey Twins. I aced English in Junior and Senior High School. Later on, a need would arise for a Sunday School skit, curriculum, or a Bible Study, and I'd take on the task. During a difficult time, poetry flowed out of me. Then came devotional writing for a small tape ministry. When the realization hit that this writing thing was a permanent fixture and not a passing fancy, I went through a major paradigm shift. Figuring out the next step proved daunting. Little support existed for Christian writers in my home state. The Internet was still in its infancy, and I wasn't online. Writing got pushed off somewhere into the future. Fast forward to 2003. I married a wonderful Christian man and moved to another state. During a gym workout, I met a woman, who happened to be a writer. She told me about a local writers' group, but didn't know where they were meeting. I finally got the name and phone number of a member and placed a call to her. She passed my information on to the President of the group. And then I waited...and waited. Sitting at my desk one day, my heart landed in the pits. From deep inside, I cried out to the Lord, "Please show me if this is really what You want me to do." Within an hour, the phone rang. The President of the Writers' Group apologized, saying she'd misplaced my name and phone number. While recuperating from surgery, she decided to go through some papers , and located my contact information. We talked for a half hour, and forged a friendship that is still going strong today. Tune in for Part II. Gayle Gaymer Martin has an extraordinary blog for writers. If you want a free writing course, her posts are excellent. She's currently talking about dialogue. I've learned a lot from this site and highly recommend it. You can find her at www.writingright-martin.blogspot.com. "Of all the dispositions and habits which lead to political prosperity, religion and morality are indispensable supports." Saturday is always a mad rush to get all my errands and chores done. Also, on the first and third week of each month, I attend a Writers' Group and a meeting at God's Treasure House. The latter organization is a wonderful ministry, providing transitional housing for women who accept Christ in prison. I've been exploring some cool websites for bloggers. There are many, which have royalty free images and music available. Believe it or not, I can't find the website address where I got this picture. However, if you Google Free images, you'll get a long list. 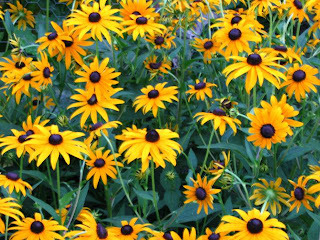 Here's a picture I found last night - one of my favorite flowers - the Rudbeckia Hirta commonly known as the Black-Eyed Susan. A dear elderly friend gave me a bookmark years ago, addressing it to Black-Eyed Susan along with a sweet compliment. Every time I see this flower, it brings back memories of him. I plant them every year in my garden. Oops, I do get sidetracked every now and then. There's another website called, "Free Essential Tools for Bloggers." The link is: http://www.quickonlinetips.com/archives/2005/04/free-essential-tools-for-blogger/. Have a blessed day. Writers and readers go together like peanut butter and jelly. This blog is a place where we can hang out, laugh, and grow. Along the way, I'll share what I've learned on my writing journey, life in general, and interesting tidbits. What else would you like to see here? Thanks for stopping by. I hope you'll leave a comment and visit again.